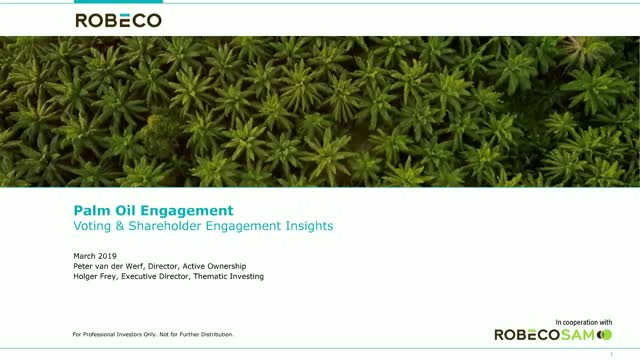 As a responsible investor, Robeco has engaged with palm oil producers, traders and buyers since 2010. However, the industry continues to face significant problems related to deforestation, its large carbon footprint, and emerging market labour standards. Join our experts to hear about Robeco’s new approach to addressing these concerns, using a combination of enhanced engagement and sustainability investing methodology. Join us to learn more about how and why Robeco is engaging on the issue of single-use plastics. We will take a look at how it is important to consider this topic from two engagement angles; petrochemical companies and consumer goods companies. Finally, we look at what this means from an investor perspective. In this podcast, David Blitz discusses the latest trends and issues in factor investing, in which investors chase factors such as low-volatility, value or momentum to get the best picks for their funds. And he says intriguingly: “We do not offer black box solutions, but rather ‘glass box’ solutions”. In the first in a series of podcasts, Daniel Wild explains why embracing SI is “a good sort of selfish”, as it enables the investor to enjoy superior risk-adjusted returns while also helping the planet on a range of environmental, social and governance (ESG) issues at the same time. Sustainability Investing has become increasingly important over recent years and consequently, it has received a large amount of media and manager focus. With decades of experience in this space Robeco has been leading the charge, their experts will explore the themes that they believe will define 2019 and beyond – and explain what these themes mean for investors. stepped up by governments, private enterprises and individuals alike. With the advent of tighter data privacy regulation, a rapidly expanding attack surface and a growing army of resourceful hackers, spending is likely to shift into an even higher gear. competitive advantages, supplemented with a basket of young challengers who are the first in employing the latest technologies. Financially material ESG factors could have a significant impact – positive or negative – on a company’s business model and value drivers, such as revenue growth, margins, required capital and risk. We take a look at how to define what is financially material ESG information and how this can be used by investors. We also look at moving from research to real life, considering the three broad approaches to addressing ESG in a portfolio how to incorporate detailed analysis effectively. As Robeco announces that it is the Sustainability Investing Partner of City to Sea, their founder Natalie Fee shares her own experience of realising that something needs to be done about plastic pollution. She takes a look at the problem and what you can do to be part of the solution. Sustainability investing is not the only approach to making an impact – active ownership can be very powerful. Carola will discuss how investors can reap the benefits of engagement around financially material ESG themes. The UN SDGs are becoming a popular lens through which investors can view the impact of their sustainability investing. However quantifying a company’s contribution to the SDGs is no mean feat. Taeke will discuss the goals, how investors might approach incorporating them in their portfolio, and the framework developed by Robeco to rate companies on their SDG impact. James Rutter from COOK joins our SI Explore in London to talk about the value of putting purpose at the centre of the business. 5-year Outlook executive summary presentation. During this presentation, Jaap Hoek, our Portfolio Strategist presents the highlights of this and the recurring theme in this report: 'Patience is a virtue', which is reflected not only in our markets analysis but also in our special topics. Jeroen Blokland from Robeco discusses an important chart each fortnight in a short podcast designed to help you stay in the picture! Robeco Institutional Asset Management B.V. has a license as manager of Undertakings for Collective Investment in Transferable Securities (UCITS) and Alternative Investment Funds (AIFs) (“Fund(s)”) from The Netherlands Authority for the Financial Markets in Amsterdam. This publication is solely intended for professional investors, defined as investors qualifying as professional clients, have requested to be treated as professional clients or are authorized to receive such information under any applicable laws. Robeco Institutional Asset Management B.V and/or its related, affiliated and subsidiary companies, (“Robeco”), will not be liable for any damages arising out of the use of this publication. Without further explanation this publication cannot be considered complete. Any opinions, estimates or forecasts may be changed at any time without prior warning. If in doubt, please seek independent advice. It is intended to provide the professional investor with general information on Robeco’s specific capabilities, but has not been prepared by Robeco as investment research and does not constitute an investment recommendation or advice to buy or sell certain securities or investment products and/or to adopt any investment strategy and/or legal, accounting or tax advice. All rights relating to the information in this publication are and will remain the property of Robeco. This material may not be copied or used with the public. No part of this document may be reproduced, or published in any form or by any means without Robeco's prior written permission. Jeroen Blokland explains why investors should pay as much attention to the earnings as they do price when thinking about P/E ratios. Sustainability investing – you have probably heard of it, but do you have all the facts about it? Robeco agrees that it's important to separate the facts from fiction.